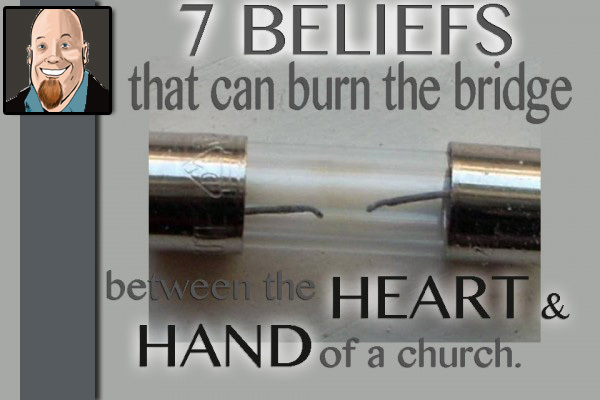 7 Beliefs That Can Burn the Bridge Between the Heart and Hand of a Church. We can be considerate in inconsiderate ways. Considerate can be defined as “Careful not to cause inconvenience or hurt to others”. As the body of Christ we can actually think it we are being considerate not to inconvenience or hurt others but act on those thoughts in inconsiderate ways. When the heart of a church cannot connect with the hands of the church it can be a very difficult thing for everyone. The congregation can feel like it is not connecting in meaningful ways with its surrounding community. The board can feel overwhelmed with its responsibility and the pastor can feel worthless. Here are seven beliefs that can contributed to church paralysis. I am sure you could add more and (as usual) I would love to hear them. 1. The belief that the church is here to fix people. We can completely loose our ability to effectively “in-reach” as well as “outreach” if we try to fix people. We are broken beyond repair. The great work of the church through the power of the Gospel is to make disciples. A true disciple is not an easy person to fix because they are constantly in process. The church needs to come alongside serve and love them through discipleship rather than equip them for church culture. What a church does with the poor, homeless, oppressed, marginalized etc… that God has placed in its sphere of influence is indicative of its doctrine. Do we take a hands off approach because we have never had success with “them”? The focus on the above verse is what the righteous DO not what kind of results the righteous get. A church in process looks forward while a church that fixes people takes inventory. 2. The belief that younger people and new members need to prove themselves faithful before they will can be heard. I see many churches that do not know what to do with children. They interrupt, cry, play games, say the wrong things and in many people’s minds are not really contributing to society in any meaningful or productive way. There is difference between being a child and childish. In the above verse it is amazing how Jesus shows this distinction to his disciples. He rebukes his followers for their childishness while blessing and laying hands on children. Today a church that can’t handle mess in a child’s diaper usually cannot handle the mess of a new member or new believer. Childishness will paralyze a church faster than anything. 3. The belief that the church’s “glory days” are in the past. Some of us do not like new things. Some of us are like Israel and we would like to think that nothing could ever beat the first exodus. But God does new things. The power of the resurrection can be on display in a church if it will expect, prepare and proclaim it. The hope of the resurrection is all about life coming from death. Looking to the past for life is as empty and powerless as looking to the crucifixion for life. If a church is all about the “good old days” like unbelieving Israel they will probably not recognize the Messiah if he comes. 4. The belief I can retire from local church ministry. I have to admit that this one is tough because some older people in churches feel displaced by the energy and vision of youth. This can turn into a war between young and old. If the older more seasoned saints in a church would deliberately decide to adopt a missionary heart toward their church’s youth and replace this new heart with their opinions concerning the younger generations just imagine the outcome. Don’t retire from the body go on mission instead. 5. The belief that compassion is a dangerous weakness. Many times we can be moved with compassion over a person we do not know. It is more difficult though when we know a person. It’s easier to build a case against helping them because we could easily say something like “well they made that bed time to lie in it.” Did Jesus NOT know the people he was ministering to? Why did God redeem us and reconcile us to himself in Christ rather than destroy us? God knew His compassion for us would result in the cross, resurrection and the death of death (Hebrews 12:2). Do we know this (Philippians 3:10) ? 6. The belief that we know what’s better for people… more than they do. Peter thinks he knows what is best for God. Though we might not think we know what’s best for God it is easy to think we know what’s best for the people we are trying to minister to. Our ministry is with the lives of others, not in the lives of others. We come alongside others not seeking to override their will but be there for them. God is the one who not only comes along side but also goes within. We can often acutely see even smallest problems in others, but very rarely the do we see or even attend to the most obvious matters in our own lives. We are called to minister not meddle. 7. The belief that we have the edge on truth. Romans 3:4… “let God be true and every man a liar.” When we raise up the faithfulness, integrity, or veracity of our interpretation of truth with pride we can paint ourselves (in our own minds and often unwittingly) true like God is true. God cannot be wrong but I can. Sometimes a church has unknowingly unhinged truth from God’s dwelling place and hung it on their own front door when they begin to act as if they have the “edge on all truth or doctrine”. We have God in Christ who is truth and we have our bibles which is truth interpreted. We are called to read, interpret and live out truth in humility. When we are with God he will not be interpreted according to our understanding but we will be interpreted according to his. That’s a humbling thought.